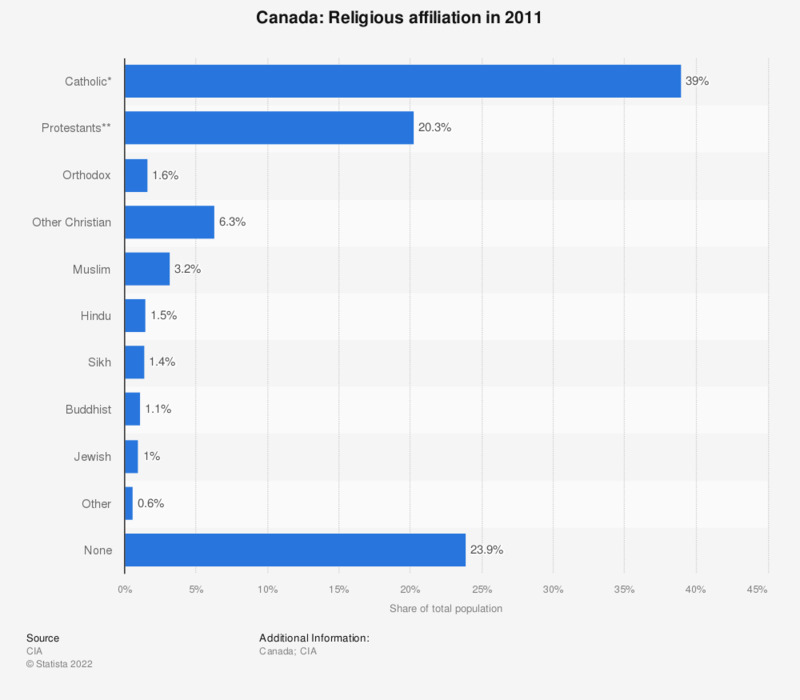 In 2011, 39 percent of the total population in Canada were Catholic, a fifth of the population identifies as Protestant, but almost a quarter are not religious at all – with the rest stating they adhere to Islam, Buddhism, the Jewish or the Sikh faith, and other Christian denominations. Canada is not a very religious country in general. Canadians adhere to a wide variety of beliefs and faiths, with the majority following Christianity, followed by those who do not believe in any deity or religion at all. As with many Western countries, the younger generations are less inclined to identify with faith, and Christianity in particular is not as popular as it is among the older generations. Alternative worship for the younger generations? Canadian teenagers are no less enthusiastic about religion than their parents, and they are just as grounded in their faith as the older generations. They are, however, also just as indecisive when it comes to whether they would call themselves religious or not. Interestingly, they seem much more interested in traditional aboriginal spirituality than in the Judeo-Christian model. They also seem quite interested in another alternative to Christianity: Buddhism is quite popular among the younger generations. Whether this signifies a general trend away from Christianity and towards religious alternatives remains to be seen. *includes Roman Catholic 38.8 percent, other Catholic 2 percent. **includes United Church 6.1 percent, Anglican 5 percent, Baptist 1.9 percent, Lutheran 1.5 percent, Pentecostal 1.5 percent, Presbyterian 1.4 percent, other Protestant 2.9 percent. Statistics on "Religious preferences of Canadians"
Canada: how do you view yourself religiously? Which of the following definitions better describe your current religious views? What was your reason for leaving your religion? How would you describe yourself as Catholic? How frequently do you pray?